Just because a student has trouble paying attention in a traditional classroom does not mean they won't be able to focus if virtually schooled. Trust me on this! I have a child who would doodle and daydream while her teacher tried to keep the attention of 25 second graders for 25 minutes of teaching. Her teacher was so frustrated she called a meeting. It seems my daughter wasn't "paying attention," but when called out in front of the entire class, she could repeat everything the teacher had said! Does that mean she wasn't "paying attention?" I think it's more like she was BORED! In my opinion, seven-year-olds should not be expected to sit still for 25 minutes straight. If your child is struggling in a classroom environment, see if they would be able to take just one class online. It doesn't have to be at home. Just see what happens when kids can move at their own pace. You might just have a gifted student on your hands. 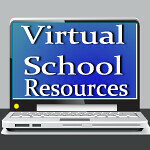 I'd love to hear about your experience with virtual schooling! Hi Kelly. I found this blog while reading the A To Z Challenge page (I'm fumbling my way through, too). I love this post and think that online courses are the wave of the future. My husband's been a high school teacher for 30 years and has seen a tremendous difference in the students over time. Our daughter is in corporate management, and you know how that goes, Big Corporations know us better than we know ourselves. In one of her seminars, they were taught about generational differences. I wish I knew more or understood better, but she told us that kids behind Generation-Why, called the Echo-Boom *seem* as if they're not paying attention, perhaps have ADD or Autism, but they're more tuned in than any other generation because of the effects of technology--they can split attention more effectively. If that's true of the generation now poised to leave high school, I can only imagine the impact on younger children. Perhaps online education isn't just a good idea but a necessary adjustment we'll need to make in order to keep up with these kids. Kudos to you for homeschooling. Until our educational system is restructured (a massive undertaking), it really is best keeping your kids under your own wing. Nobody knows, or loves, them more. Interesting ideas on teaching kids!! Thank you for stopping by! !